With it nearly being Christmas, I thought I would put out one more blog post before the traditional years round up! This time I want to look at a concept I have been talking about for a while, but have never really explained properly. Thin Layer and Deep Level gamification. This covers things that are added to the “top” of a system. Points, badges, game like interface components. This type is less about engagement as it is about entertainment, but has its place as I explained last week. Deep Level is where the real engagement and problem solving come in. Covering everything from Games / Serious games to pure intrinsic motivation driven systems, Deep Level is where you will get the biggest returns – and development bills! This diagram shows the basics of what I am talking about. Described here as Short Term Thin Layer. This is what most people associate with gamification, points and badges. An example of this can be seen on my site with my implementation of Captain Up. This is more of an entertainment feature, but can give short term in engagement especially when you are measuring based on page views on a website. Long Term Thin Layer means that whilst this sort of design may not be hooking into the deepest of intrinsic motivations, it is designed to stay with the user for the entire time they are using your system. Remember, this is user interface, not user experience! Serious games are Short Term Deep Level. This means that they are deeply engaging, but designed for a specific purpose that lasts finite period of time – ie the length of the game. Think of things like Fold.it Once the problem is solved, the game finishes. Of course you can argue that games can last years – but most serious games are designed to solve a problem and that’s it. Long Term Deep Level gamification. This is what people strive for. A system that keeps you involved because you want to be involved. There may be thin layer trappings, but RAMP is why you are there (Relatedness, Autonomy, Mastery, Purpose). Take Stack Exchange. Whilst some are there for the points and the badges, may are there because they enjoy helping people. Giving them bonuses and meaningful extras (like access to administrative tools) adds to this in a much deeper way than the PBL based rewards. These categories are just there to help clarify the differences between different approaches to gamification. Each one is valid and has its uses. Each one can be combined with any other one to create a system. If you went to a meeting where you were discussing gamification of a new product, you could show someone this chart and say “If you want short term engagement, look to the left. IF you want long term, look to the right. If you have money and want to do this really well, look at the top, if you don’t have as much money, look to the bottom”. good concept. It explained each segment clean and well. But i still don’t understand, is engaging user interface also considered gamification? what kind of interface? Although i know that user interface and experience are different. In the case that user interface are the engaging factor, isn’t the good experience that make it impactful in long term? If you are using game like elements or ideas in your user interface, then it could be considered gamified. So if you have a form and you as people to build an avatar rather than tick gender boxes, that would be a little bit of gamification. A nice UI, even an engaging one, is only gamified if it has something that comes from games in it. Either way, always always have an engaging interface!! Oh, ok. Thanks for explanation. So, it means gamified interface. Its just my opinion, but i think people only seeing your 4-quadrant diagram and brief explanation without reading the whole concept will probably get different idea. 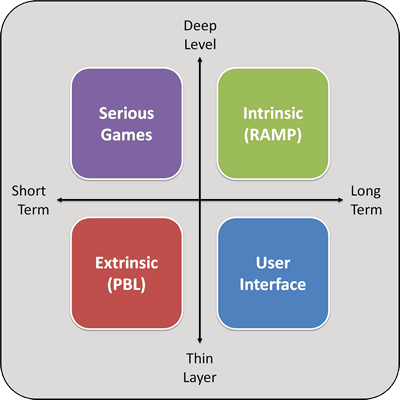 At first, i think every deep level is about intrinsic, and thin layer is extrinsic. But as i understand now, it’s not. User Interface (as you mentioned, avatar) for example, is more like autonomy core drives which is intrinsic. Serious game also can be extrinsic driven, like playing driving simulator for getting a license, rather than just master it. Interesting stuff… Very clearly explained and makes a lot of sense! But do you think a serious game can also be intrinsic. For example, if the serious game requires problem solving and instead of finishing once the problem is solved it offers new more challenging problems? Or does this mean it steps over then into the intrinsic category? Ooo, good question. The point with a serious game is to achieve something. Be it problem solving, teaching or what ever. This is a short term goal. Now, we all hope that a serious game is intrinsically rewarding to play – fun if you will. Having new challenges and hours and hours of gameplay, whilst not the norm, does happen (fold.it for example). Does that push it into long term intrinsic gamification? Possibly yes. However, the goal was still short term. Solve a problem.